Want to have a fun, semi-traditional Oktoberfest party with traditional food and music? Ok, well, then how about an excuse to get together with people you like and drink beer with some good food? Here’s how to host a successful Oktoberfest party in three easy steps. For more on traditional menus and recipes, I recommend this Oktoberfest food guide. Step 1: Invite friends and neighbors who can walk or take public transportation to your party. Step 2: Plan a menu (more on that below) that goes well with beer and assign your guests to bring a dish or beer. The point is not to spend all day in the kitchen, unless you are my neighbor Josh (more on that below). Step 3: Download traditional music and be prepared to switch to something less polka-like after about an hour. First the pretzels, which I modified from the Oktoberfest party guide. This is a fun project for children or kitchen bystander participation. 1. In a small bowl, dissolve yeast in 1/8 cup warm water. Put the yeast mixture into the workbowl of your food processor with the dough blade attached. Add in 1 1/3 cups warm water, 1/3 cup brown sugar, and the flour. Pulse until dough is blended. If dough is too crumbly or dry, add small amounts of water and pulse until it comes together into a ball. 2. Take dough out of processor and on lighly floured surface, knead dough until smooth and elastic. 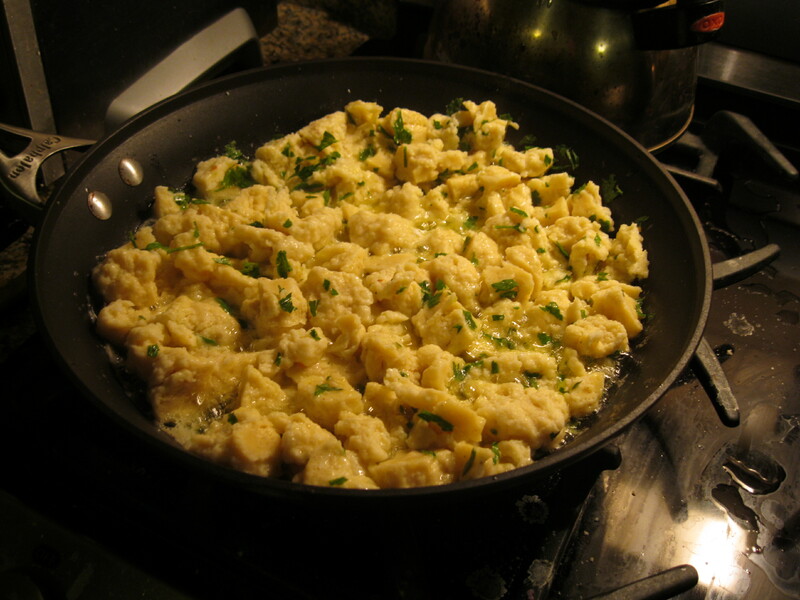 Divide the dough in half and in half again and cut into 4 pieces for a total of 16 pieces. Roll each piece into a pencil shape with your hands. Pick up both ends and tie it into a knot or twist it into the shape of your choice. Repeat until all pretzels are formed. 3. Heat oven to 400 degrees. Fill a saucepan with water, one cup at a time until it’s 3/4 full and then add 2 tsp baking soda to each cup of water. Bring it to a boil. 4. Prep two baking pans by sprinkling them with Kosher salt. 5. Once the water in boiling, put one pretzel knot onto a spatula and drop it into the water. Keep it in the boiling water for about 20-30 seconds until it puffs up a bit. Use the spatula to remove it from the water and put it on the prepared baking sheet. Repeat until all pretzels are boiled, and be sure to space the pretzels on the baking sheet beause they will expand a bit. 6. 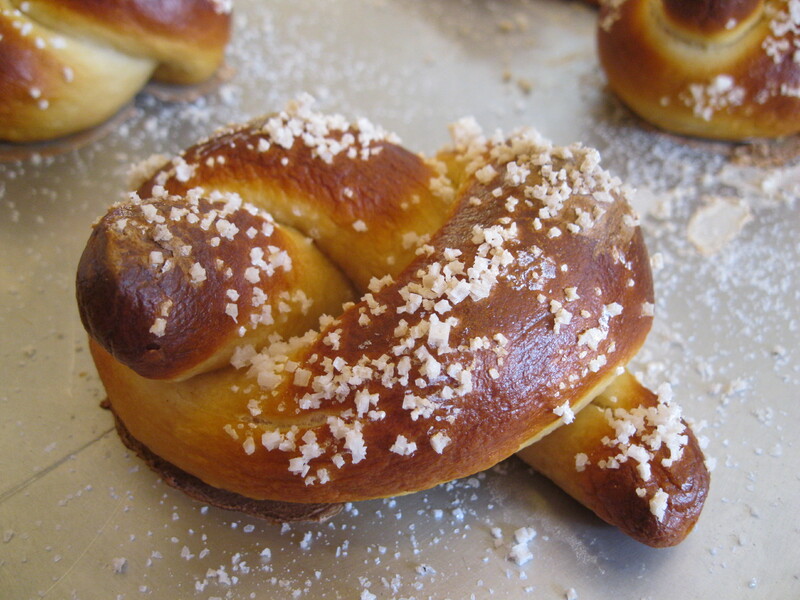 Sprinkle the top of pretzels with course ground sea salt. Place the baking sheet with pretzels into the oven for 8 to 10 minutes or until pretzels are golden brown. (Because oven temperatures vary, check after about 5 minutes and keep a close eye on them). 7. Serve warm with mustard of your choice. 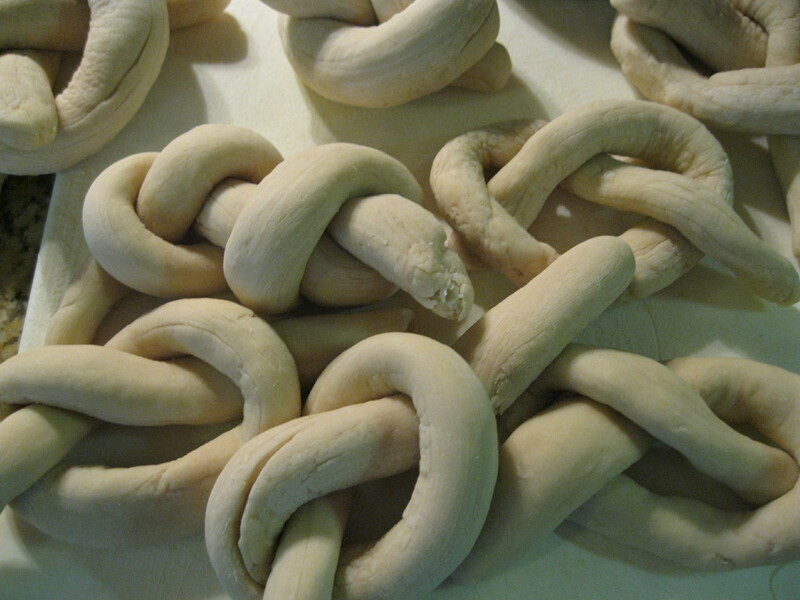 Pretzels can be made earlier in the day and reheated at 350 for 10 minutes. 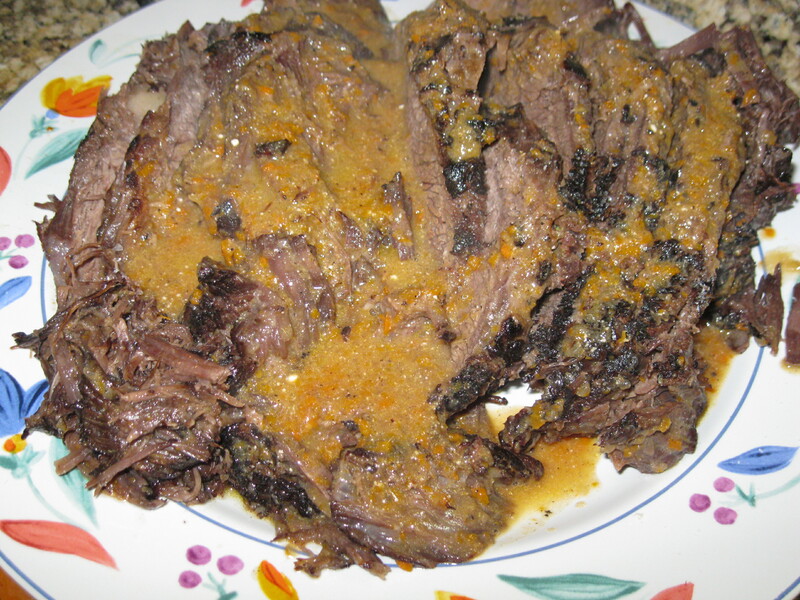 This is a nice alternative to sauerkraut and delicious with a forkful of sauerbraten. I used the leftover braised cabbage in a sandwich with roasted lamb and pear, and in a sandwich with grilled cheddar cheese and apple. This is modified from Dr Oetker’s German Cooking Today. 1. Peel the onion and cut into small dice. Wash the cabbage, cut it into quarters, and cut out the core. Cut into thin slices. Wash and peel the apples, cut into quarters, remove the core, and cut into thin slices. 2. Heat the oil over medium heat in a large saucepan. Add the onion and saute, stirring often, for about 5 minutes. 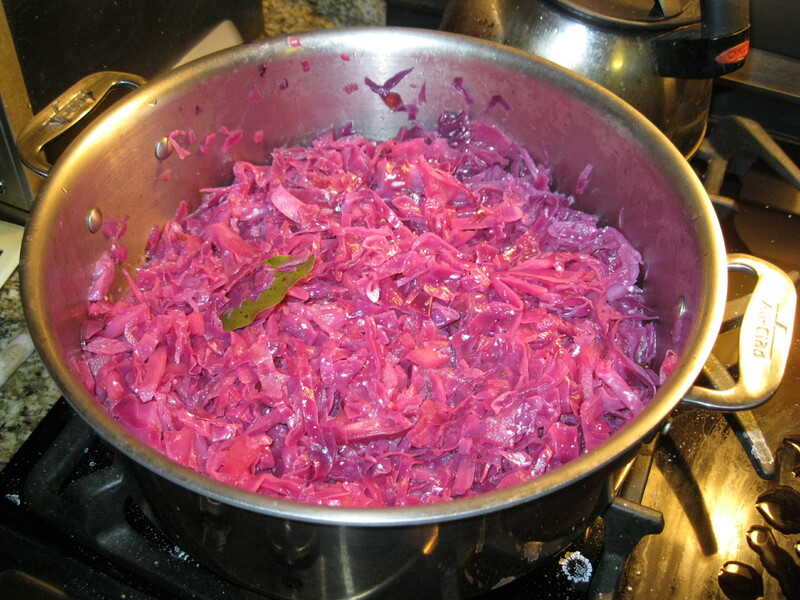 Add the cabbage and the apple, turn the heat to medium high and add the remaining ingredients and 1/2 cup of water. Cook covered over low heat for 45-60 minutes, stirring occasionally. 3. Add salt and pepper to taste, and add more sugar or wine vinegar as needed. Remove the allspice and juniper berries and the bay leaf. 4. Serve warm. Freeze leftovers in small containers so that you have an instant sandwich condiment on hand. This entry was posted in Comfort food, Healthy, Holidays, vegetables and tagged how to host Oktoberfest party, Oktoberfest cooking by Amy. Bookmark the permalink. Mmmm, I love a good soft pretzel! Everything looks great!